Quiet Barrier™ LD Soundproofing Composite with PSA is the ideal soundproofing solution for Do-It-Yourself-ers and construction experts alike. This thin soundproofing composite with PSA is affordable, versatile, easy to install and features amazing sound-blocking power. It starts with the 1/16-inch thin soundproofing material with PSA, powerful enough to block most sound from getting in or out. That soundproofing power is enhanced by a full inch of acoustical-grade polyurethane foam. Together, they create a soundproof composite that protects your privacy and frees you from annoying or even harmful external noises. 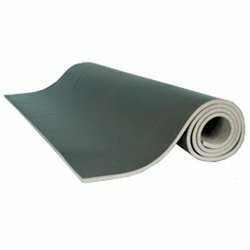 The polyurethane foam also serves as a buffer between the barrier membrane and the mounting surface, so vibration effects do not get through and compromise the barrier’s sound-blocking ability. 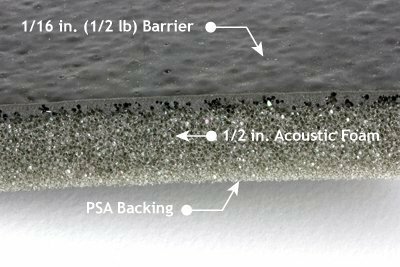 If you’ve never tried a sound control solution before, the Quiet Barrier™ Soundproofing Composite with PSA is the perfect one to start with. You’ll be amazed at how quickly and easily you control sound wherever you choose to install it. And if you’ve never installed soundproofing before, you’ve picked the perfect product, thanks to the PSA feature, a strong-bonding peel-and-stick adhesive that means all you have to do is remove the film backing and stick it in place. 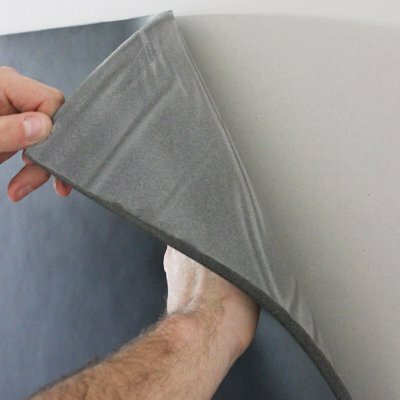 With this soundproofing composite, installing is as easy as can be. You can have an entire space soundproofed the day your order arrives. To see for yourself all the amazing sound control options you have with the Quiet Barrier™ LD Soundproofing Composite with PSA, order some now. Quiet Barrier™ LD Soundproofing Composites (1/16 in. 1/2 lb. barrier + 1/2 in. 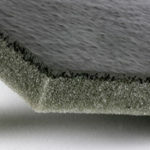 foam) are industrial grade products that stop sound from entering or leaving a space. 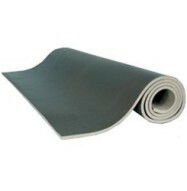 These products are composed of Quiet Barrier™ soundproofing membrane and acoustic grade, polyurethane foam. 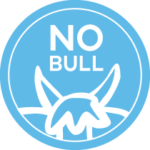 The Quiet Barrier™ provides mass and blocks noise, while the acoustic foam works as a decoupler, structurally isolating the Quiet Barrier™ layer from the wall or ceiling assembly, which in turn improves the sound stopping performance. Triple soundproofing function — The mass of Quiet Barrier™ blocks sound while its flexible nature dampens sound energy. The Acoustic foam acts as a decoupler, structurally isolating the heavy barrier layer from the construction assembly, ultimately increasing the sound blocking performance. Low Profile — Quiet Barrier™ soundproofing composites range in thickness from 9/16 inch to 1 ¼ inch, saving valuable square footage. Variety — Quiet Barrier™ soundproofing composites are available in a variety of weights and thicknesses. Quiet Barrier™ soundproofing composites are available with an optional “peel and stick” pressure sensitive adhesive (PSA). In-stock — We stock all advertised sizes and configurations of Quiet Barrier™ soundproofing composites. Most products are shipped the same day they are ordered and arrive at your project in three business days. Proven History — Over 1 Million square feet of Quiet Barrier™ soundproofing composites are installed in projects nationwide. Flammability — Quiet Barrier™ Soundproofing Composites contain polyurethane foam that has a flammability rating of UL94 HF-1. Before choosing this product, be sure the flammability rating passes your local building code for exposed materials. Which Quiet Barrier™ Soundproofing Composite is right for me? Quiet Barrier™ Soundproofing Composites can be added to a variety of existing wall constructions to improve the sound blocking performance of the structure. Choose the right Quiet Barrier™ Soundproofing Composite based on the type of noise you are trying to prevent from entering or leaving the space. As a rule, the thicker and heavier the Quiet Barrier™ Composite, the better it will be at reducing sound transfer. The thinner Quiet Barrier™ Composite products perform well when trying to deter common noises with average decibel levels. 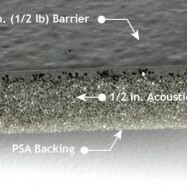 The thicker Quiet Barrier™ Composite products perform well when trying to deter common noises with high decibel levels. In essence, the louder the sound you are trying to stop, the thicker the product needs to be. First determine how much sound you need to stop, and then choose the appropriate product. In essence, Quiet Barrier™ Soundproofing Composite products block the transmission of noise from one area to the next. 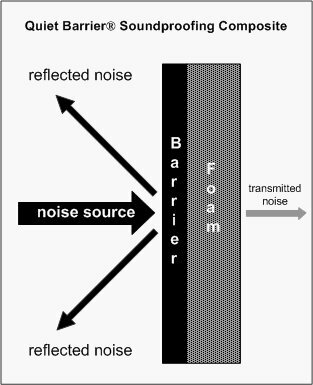 The “noise source” hits the barrier and is reflected back into the room or space of origin. See figure 1. Typically, the noise is not muffled or absorbed in any way, which means that decibel level within the source room remains the same or is increased. The difference between the source noise and the transmitted noise is the sound transmission loss. Before applying this product all surfaces must be dry and clean, free of any grease or oil. I wish everything you sold had the PSA backing on it. It made installing this composite so much easier.